Applying voltage using the Analog Discovery's Voltage instrument to a diode to produce light. Utilize the Analog Discovery's Voltmeter instrument to measure voltage in a circuit. Using the Analog Discovery's arbitrary waveform generator to apply a time-varying signal to an LED to make it flash on and off. This project builds off of the previous Analog Discovery material. Use the arbitrary waveform generator on the Analog Discovery to apply sinusoidal and swept sinusoidal voltages to a speaker. Use the arbitrary waveform generator on the Analog Discovery to create frequency modulated signals and apply them to a speaker. This project builds off of the previous Analog Discovery material. Use the Analog Discovery to play back .wav files through the speaker included in the analog parts kit. This project builds off of material presented in previous Analog Discovery projects. Use the Analog Discovery's ability to import "custom" waveforms from a file. 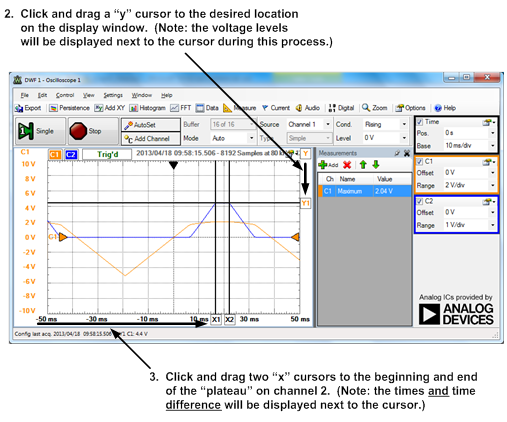 Use the Analog Discovery's ability to create "custom" waveforms according to a mathematical function. Introduces the Analog Discovery's Oscilloscope instrument. Explains the basics of the ways in which voltages are acquired and displayed by the oscilloscope. How to use some of the most basic and common oscilloscope tools to simplify the measurement process. Use the Analog Discovery to plot the voltage-current characteristics of a light emitting diode. Export the voltage-current data of a light emitting diode. Acquiring vibration data from the piezoelectric sensor from the analog parts kit. The Arbitrary waveform generator instrument will be used to apply relatively rapidly varying wave forms to the oscilloscope, and then triggering of the waveform will be used to make the waveform easier to view and analyze. Introduces the use of the math channel function on the Analog Discovery. This function allows the user to perform a wide variety of mathematical operations, all of which can be applied to the voltages being measured. In our first two oscilloscope projects, we examined the way to display a waveform on our oscilloscope so that we can visualize the “shape” of a voltage with respect to time. We can measure parameters that we may be interested in—amplitudes, frequencies, phase differences, and so on—directly from this display, since vertical and horizontal scales are provided on the display; however, most oscilloscopes provide tools which assist in the measurement process. This project will familiarize us with some of the most basic and common tools used to simplify the measurement process. Please be aware that these tools are not a substitute for scrutinizing the waveform display itself! Measurement tools are intended to be used in conjunction with engineering insight into the circuit's behavior. When an oscilloscope displays a “measurement”, the tool may be making assumptions about the waveform which are not valid! Always perform at least a rough double-check of any displayed measurements against the waveform itself. The tools introduced in this project are the measurements tool and the cursors. The measurements tool provides automated measurement of a number of common parameters. The cursors are generally used if a specific voltage or time measurement is desired, which needs to be customized by the user. Complete the second oscilloscope project relative to Triggering. 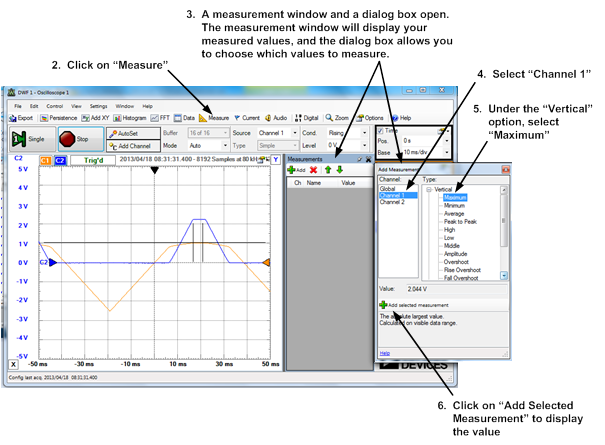 Use the Analog Discovery™ oscilloscope measurement and cursor functions to display signal parameters. If you have completed the Oscilloscope Triggering project, and your circuit is still intact, you will be ready to begin this exercise. If you no longer have the circuit set up, check out and construct the circuit displayed to the right. First, we will measure the maximum value of the channel 1 voltage displayed on the screen, as shown below. The measured value should appear in the list in the Measurements window. Check the value against the waveform shown in the display screen, to see if it makes sense. You can add additional measurements using the Add Measurement dialog box now. When you are done, close the Add Measurement dialog box. You can add more measurements to, or remove existing measurements from, the Measurements window by clicking on the or buttons. Try it! We will use cursors to measure the maximum value on channel 1 and the duration of the flat “plateau” of the channel 2 waveform. In general, to set up a cursor, click and drag the and icons located near the lower-left and upper-right corners of the display window. Two “x” and two “y” cursors are available. Steps to set up cursors for the specific measurements we want to make are shown in the figure below. The images above are screenshots of Digilent WaveForms running on Microsoft Windows 7. Use the Measurement window to measure the maximum channel 2 voltage that you used cursors to measure in part B. Does the value in the Measurement window agree with the results you obtained with the cursor? Use both the Measurement window and the cursors to calculate what you would think of as a “rise time” for channel 2. (Generally, “rise time” indicates the time required to get from one voltage level to another. It is usually measured as the time necessary to get from 10% to 90% of the difference between the two voltage levels.) Do the results make sense relative to one another? Other product and company names mentioned herein are trademarks or trade names of their respective companies. © 2014 Digilent Inc. All rights reserved. 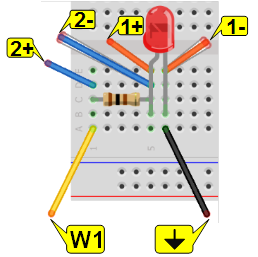 Circuit and breadboard images were created using Fritzing.